Exposure to mould can be very dangerous to your respiratory health and may lead to various allergies and medical conditions that would be avoided in a clean air environment. If you live or work in a mouldy environment make sure you take action before the mould spreads and infests your space like in the photo below. In this situation we advised the client to move out immediately. The spread of mould can be very quick, trying to clean it yourself could lead to further spread. It is important that mould damage remove be managed in professional manner to minimise spread and to ensure that the air in your space is decontaminated and is healthy for you and your family to breath. At Capital Facility Services we are amazed at the number of requests we receive to assess mould damage across all area of Melbourne and the number of people who are ignorant of the impacts mould can have on their health and particularly on the health of young children. 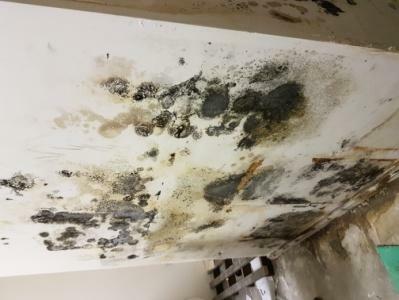 Often tenants are affected and they are in dispute with landlords over the cause of the mould damage and who is responsible to fix the problem. If you are living in a mould infested home you should have it accessed to determine if it is safe for you to live in it. If it is not safe, to live in, then move out immediately. If you deal with us at Capital Facility Services we can provide you with a report to outline the issues and the possible impact on your health, you can then use this as part of the resolution process with your landlord. Mould can be very dangerous, do not ignore it. Have it managed by professionals who know what they are doing, this is important for the wellbeing of your family. If you live in Melbourne, call Capital Facility Services any time to discuss your situation and determine the best way forward regarding removal of mould in your home or business. This entry was posted in mould damage. Bookmark the permalink.